Do you ever have times where you feel you pass through life with your eyes shut? Do you ever feel you make subconscious assumptions about people, underestimating them due to the setting in which you meet them? Well, I know I do. As little boys we used to play little boy games. Often it was football where the rebels would all pretend to be George Best, tearing down the wing with their shirts out. No thought then of what George was up to in his spare time with Miss World. The good boys, shirts tucked neatly into their shorts, would pretended to be Bobby Charlton with his bald head and rocket shot. On other days we would be motor bike racers pedalling furiously on our bicycles round the pavements where we lived, three abreast with no concern for little old ladies on their way back from the shops with pull along baskets. Or we played soldiers and often some of those soldiers were Gurkhas. We picked the Gurkhas because they were the meanest, hardest, most dangerous soldiers in the history of soldiers. The Gurkhas come from Nepal. The Victorians called them a martial race and the head of the army in India once said: “If a man says he is not afraid of dying he is either lying or he is a Gurkha”. Their own motto is: “Better to die than be a coward”. They carry large knives called Kukris and, although they are now said mainly to be used for cooking, the legend was that once removed from its sheath the Kukri had to taste blood. During the two world wars 43,000 Gurkhas were killed. To put that in context there were only a maximum of 112,000 of them at any time. They number a few thousand now but every year 28,000 young Nepalese men apply to join. Only 200 pass the test. There is a 100 km long annual race in England which takes place over hills called the South Downs. The fastest time ever recorded by a Brit is over 12 hours. The Gurkhas, who come from the high Himalaya mountains and so consider these hills as almost flat terrain, regularly enter the race and always come in under eight. A Gurkha once applied to join the regular British army and went on the basic training assessment course. He broke his leg but still finished top ahead of everyone else. You get the picture? We are talking hard, fearless men. That’s why the Queen has two of them as her personal bodyguard. It’s said that when they fight, they fight for their families for whom there is the tightest of bonds. That fact is relevant to my story as you will see. So, many years later and no longer a boy, I would pass through the doors of a shiny, smart office in the heart of London’s Soho. The centre of media land in a country which punches way above its weight in that field. And I would pass into a world kept going by the efforts of immigrants. In general, the local population doesn’t want to clean those offices early in the morning or stay up all night keeping them safe, not least because the wages for those jobs would make it hard to live and bring a family up in London if they did. If I was early or late I would pass a smiling man on the reception desk. “Hello sir. How are you today?”, he would say, this nice man with a smile, obviously Asian but not Chinese, Indian or Thai. I would usually have some preoccupation, replying “OK, thank you”, and smiling back before passing on with not a thought for him. He was just a nice man with a smile, not particularly interesting and not worth me stopping to find out more about him and his world. Then one evening he wasn’t there. An earthquake had ripped Nepal asunder. The devastation was terrible, many were dead and many more were trapped alive in one of the poorest regions of the world under the rubble of whole towns and villages which no longer existed. Getting machinery through mud tracks over the worlds highest mountains where the air is so thin it saps your strength in minutes was impossible. You had to be born there to help and our man was once a Gurkha. Yes, the nice, smiling man was a trained killer, capable of snapping my neck if he felt so inclined and now he was in Nepal using his training, skill and resourcefulness, with whatever tools were to hand, to rescue his family from the catastrophe they were the victims of. And he did rescue them. Then he returned to London where he continues to greet everyone coming into the building with a nice smile, and a cheery hello, a positive influence on a world which takes him for granted and knows nothing about him. So what do I know about people? Perhaps in London there are just too many to be interested in. I’m reminded of that scene in Crocodile Dundee where the man from the outback walks down a New York street on his first day saying “G’day” to everyone. You just can’t do it. But at the same time, I know I should pay a little more attention and live a little less in my bubble. What’s more, the nice, smiling man gave me a song. You can listen to it here. So what would I have been able to do if I had been in this man’s position and my family had been trapped beneath a mountain of rubble in need of being rescued? Sing them a song? We’ve Got a New Album Out! We’ll make no bones about this email. It is disgusting spam whose only aim is to relieve you of your hard earned cash. Therefore we’ll keep it short. 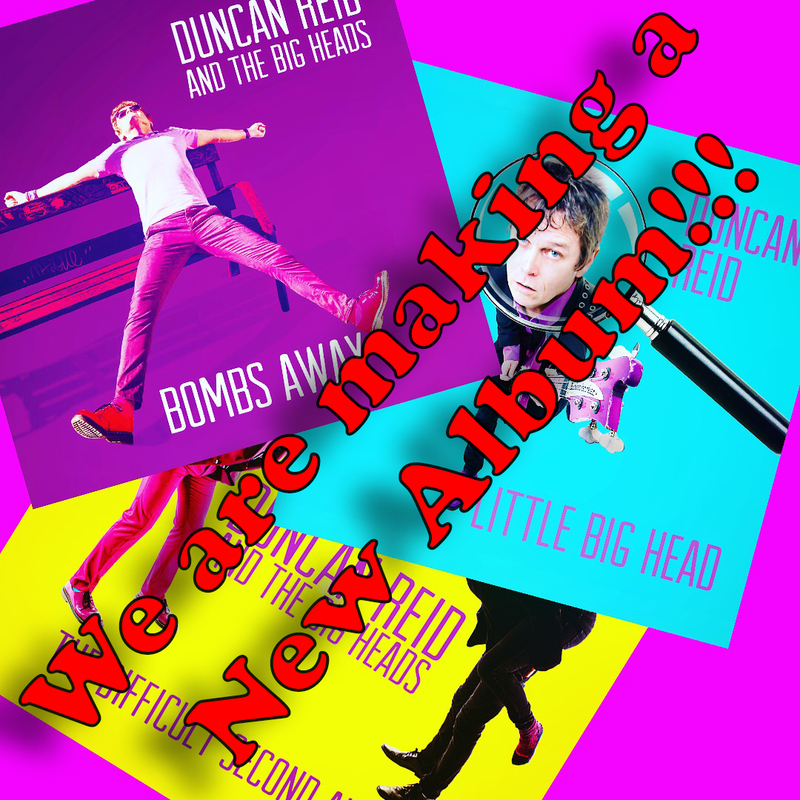 Duncan Reid and the Big Heads have a new album out called Bombs Away. Everyone who has heard it says it’s our best one yet including the critics who are going mad about it. If you want to buy it we would very much like you to email us at duncan@littlebighead.co.uk since we are greedy buggers and that way we don’t need to pay all the other thieves in this business like Amazon/Paypal/Apple etc. However, the album will be available from all those sources, as well as our Bandcamp page, and we will still be delighted if you chose to buy it that way. Apologies for this unwarranted intrusion into your inbox. Actually, let’s not be two faced about this. We don’t actually give a damn as long as you pay us which we very much hope you will do.